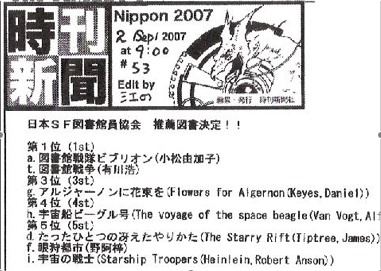 This year's Japan SF Librarian Association Meeting, which is the 11th, has held in WorldCon! In honor of attendances from the world, the association is expected to present a special agenda. Librarians and library users who would like to participate can participate. Caution! The association designate Japanese as the official language. If you can't understand Japanese, it is mandatory that you install the Babel Fish (or some sort of translation software) in your ear. This Meeting is an program of Nippon 2007. First of all, you have to entry Nippon 2007. And make a wish upon the moon for this meeting will not overlaps with other programs which you want to join. You could possibly get our sticker of "Sticker Exchange Program".